Flower arrangements and centerpieces for the French inspired home. Everyone loves to have fresh flowers but it's not every week that we can get to the floral shop to buy them and sometimes there are spaces in the home that call for a 'remarkable' option -- a floral arrangement and container that truly ties in with the space and its decor. For those times, it's nice to invest in a silk floral that will last for many years to come. Handcrafted arrangement of light purple hydrangeas and light green viburnum in a square mirrored container. Faux silk (polyester) stems. Handcrafted faux floral arrangement in glass vase. Polyester florals. Handcrafted faux floral arrangement in glass bowl. Faux silk (polyester) stems. Handcrafted faux hydrangea arrangement. Glass vase. Polyester florals. Fall colored florals of Queen Anne's lace, peonies, hydrangeas, ranunculus, and amaranthus are arranged in a glass container. Handcrafted faux magnolia floral arrangement. Glass vase. Polyester florals. Our faux blossoms arranged in a glass vase topped with a gold band capture the fleeting nature of spring yet allow you to enjoy the beauty year long Handcrafted faux dogwood arrangement. Ceramic vase. Polyester florals. Handcrafted faux-peony arrangement. Glass vase. Polyester florals. Gorgeous gathering of pure-white, star-shaped lilies bloom into a stunning bouquet partnered with cream-toned roses that craft pure beauty in any setting Stunning peonies, roses and hydrangea's arranged in a charming silver trophy style vase, with a strong focus on the lustrous shades of white and thick layers of petals artisans were sure to capture from nature. It lends itself as an electrifying statement... electrifying any interior setting. This low arrangement of white water lilies and white marble stones, nestles in a shallow round light blue bowl, would be the perfect arrangement for a cocktail table. Blooming Magnolia Centerpiece, flourish magnolia's set in a gold footed container allowing our designer to flair and expand the natural branches, showcasing every stage of this gorgeous flowers bloom. Handcrafted large arrangement of hosta, nandina, apple blossom, kiwi, and hydrangeas. Silk/polyester stems. Gold-painted aluminum container. Soft ranunculus blossoms in a lovely bouquet are presented in a rounded glass bowl overflow to give life to any interior setting. Handcrafted concrete bowl filled with preserved roses from Ecuador. Finished with preserved mosses with long lasting life. Golden orchids are artfully displayed on a curled etched silver metal display container. Preserved white roses add touch of contrast. Faux magnolia arrangement in fluted stain glass container Handcrafted arrangement of faux paperwhites. Poly silk stems; preserved basil foliage. Ceramic container. Lifelike, handcrafted hydrangeas and roses in a glass vase. Florals, polyester. The gold finish on this birch wood container contains multiple white and green florals. The white and green florals of hydrangeas, roses, helleborus and viburum make this elongated arrangement a great piece for any console or table Hand-cut elongated wood log filled with organic mosses and 4" preserved roses for a finished organic piece. Fully organic - stems from mother nature. Soft preserved roses from Ecuador. Preserved long living moss. "Diamonds & Roses" faux floral. 6"Sq. x 7"T. White rose nosegay and greenery of polyester and silk. Clear crystal square vase. Designed with removable nosegay, so both nosegay and vase may be used separately. Made in the USA of imported material. Hand-carved wood log is filled with preserved roses, preserved moss, and polished yellow stones. Approximately 36"L x 9"D x 10"T. Handcrafted Hydrangea & Roses faux floral. 18"W x 16"D x 11"T. Faux hydrangeas and roses. Glass vase. Made in the USA of imported material. Preserved roses, preserved moss, and sedimentary amethyst stones in a polished golden urn. Approximately 18"Dia. x 13"T.
Handcrafted nosegay arrangement of roses, peonies, and lilac sprays. Polyester silk floral stems. Glass container. Lovely enough to stand in for the bride's bouquet, this arrangement of faux roses, peonies, and other pink and white flowers is simply breathtaking. Handcrafted bouquet of faux peonies. Polyester silk stems. Glass container; acrylic "water." This elegant arrangement brings bright blooms and greenery to your home. Set in a glass vase, these calla lilies are a fresh and easy update in a room. The spectacular trumpet shape of the lily makes it a garden favorite. This lily’s tall stems are nestled among slender green leaves for an amazingly realistic appearance. Set in a white pot, it’s an elegant botanical accent on a tabletop or mantel. This elegant arrangement brings bright blooms and greenery to your home. Set in a glass bowl, these calla lilies are an easy springtime update in a room. The Lalique Fighting Fish is sculpted through highlights of crystal, playing on reflections and transparencies. Native to Southeast Asia, these warlike fish can engage in lethal battles of violent beauty. Its plentiful fins undulate and intertwine like colored veils in a spectacular aquatic ballet. As one of the most important symbols in Asian culture, the Koi Fish represents good fortune, virility, perseverance and longevity. The symbolism is rooted in an old Chinese legend where a Koi fish swims the Yellow River upstream, battling the current to get to the top of a waterfall where it is rewarded by the gods who turn it into a golden dragon. The carp has thus become a symbol of success, determination and destiny fulfilled. This legend remains celebrated today during Kohinoor, when young children are wished success. This vase majestically embodies this ancestral legend with twelve Koi fish swimming upstream in swirls of satin-finished crystal. The Lalique Fighting Fish is sculpted through highlights of crystal, playing on reflections and transparencies. Native to Southeast Asia, these warlike fish can engage in lethal battles of violent beauty. Its plentiful fins undulate and intertwine like colored veils in a spectacular aquatic ballet. The raw beauty of the Languedoc region in France has inspired many artists, including René Lalique who designed the original Languedoc vase with accentuated relief and generous proportions in 1929. Fashioned in signature satin-finished and re-polished crystal, cactus leaves overlay in a graphic play on repetition. The iconic vase is re-imagined in a petite version in striking black crystal Handcrafted re-interpretation of the iconic Bacchantes vase. Satin-finished lead crystal. In 1926, René Lalique designed the Tourbillons Vase. Inspired by the movement of the fern blossom, the abstract design allows for the utmost freedom of interpretation. Graphic and poetic, its curves follow the rhythm of light, drawing the eye inwards towards the swirls of crystal. The iconic vase is transformed in a petite version and striking black crystal. Handcrafted lead crystal vase. Handcrafted vase of lead crystal. 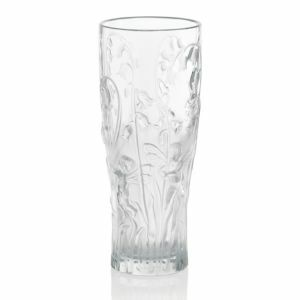 Handcrafted Oxymore large vase in clear. 6.7"Dia. x 9.8"T. Crafted of crystal. Hand wash. Made in France. Handcrafted object. Lead crystal. Can be used as a glass, a vase, or a holder. Made in France. Handcrafted vase. Lead crystal. The Fairytales Collection by Lalique defines a new expression of beauty. This crystal giftware revives Rene Lalique's passion for Nature and its magical floral, mythical fauna and allegorical themes. A brilliant gift that each will interpret in his or her own way, adding flowers or a large candle With its beautifully rounded and very delicate silhouette this timeless creation pursues its enlightened path through history. Handcrafted vase, Full-lead crystal. 7"T. Made in France. Handcrafted vase. Full-lead crystal. 8.25"T. Made in France. Full-lead crystal. Handcrafted. Made in France. Handcrafted vase. Full-lead crystal. Design features nine "pyramids" on the main faces, three "pyramids" on the sides, and a vertical gadroon motif on the interior to reflect and scatter light. Handcrafted vase. 7.875"T. Crystal. Hand wash. Made in France. Designed by Thomas Bastide. Clear- crystal vase. Limited edition. Handcrafted vase. 5.875"T. Crystal. Made in France. Designed by Nicolas Triboulot. Clear crystal vase. Rectangular shape with inner vertical beveling and external horizontal beveling. 7.875"T. Made in France. A combination of horizontal cuts on the outside and vertical cuts on the inside paired with vibrant color gives this vase extraordinary visual effect as it creates a stunning interplay of light.